This scientific illustration by Arthur Bartholomew was commissioned by Sir Frederick McCoy, Director of Museum Victoria as part of his zoological research. It forms part of the much larger Prodromus Collection. Many of the original illustrations in the collection informed the production of the two-volume work "The Prodromus of the Zoology of Victoria", which was Museum Victoria's first major publication beginning in 1878. McCoy would bring specimens to the laboratory where they were tended and illustrated by his lecture room assistant, Bartholomew, whose delightful images of living specimens, in particular the order Lepidoptera (moths and butterflies) are among the collection's highlights. 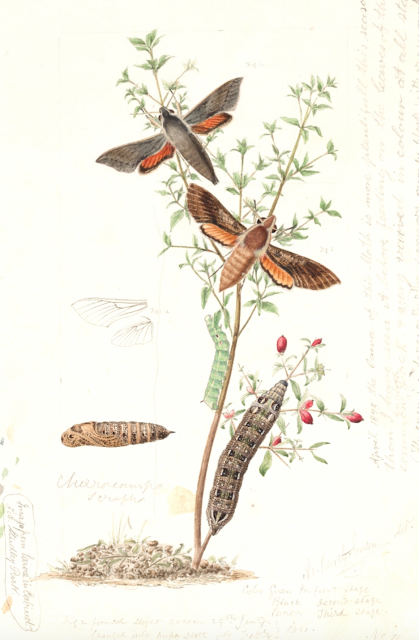 For almost forty years insect larva were collected along with their host plants and brought to the laboratory for illustration. Bartholomew would faithfully illuminate each life stage of the insect, noting the date of each successive metamorphosis. When the perfect imago (adult insect) emerged, the species would be identified by William Kershaw, pinned and entered into the collection. The level of detail attained by Bartholomew in these illustrations makes them one of the most significant contributions to natural history illustration in colonial Australia. You can see this image in more detail in Google Art and Culture.